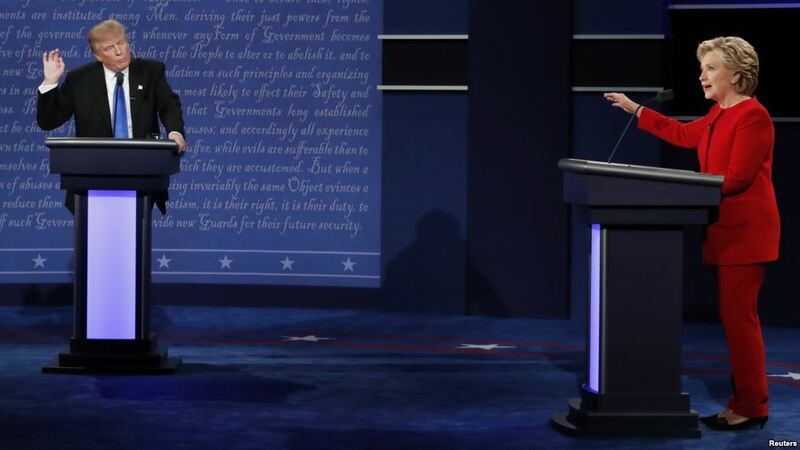 The two worst people in America debated last night. Donald Trump was not intellectually capable of challenging Hillary Clinton’s long history of bad decisions and poor judgement throughout her career. Clinton was better prepared, and it didn’t take much to out-debate a buffoon like Trump. It is a shame that Jill Stein and Gary Johnson weren’t allowed to participate and provide a more meaningful challenge to Clinton. George W. Bush and Barack Obama both recovered from poor debate performances to win reelection. Sanders did better against Clinton as the debates went on. Maybe Trump will do better in future debates, but I’m not sure that he has the ability to improve. He did start out looking like he had a chance, trying to look calm and presidential in the first half-hour. Watching Donald Trump trying to remain calm was like watching Bruce Banner, wondering when he would turn into the Hulk. It didn’t take long for Trump to repeatedly interrupt Clinton and look foolish making faces while she was speaking. The debate was primarily a contest based upon such superficial matters, with limited consideration of the issues. Without Stein or Johnson present, nobody was going to look at the issues which neither major party candidate has any interest in, such as ending the state of perpetual warfare started after 9/11, or curtailing the surveillance state. The initial polls, such as from CNN, showed Clinton to be the winner, but I doubt that many supporters of either candidate will change their minds based upon the debate. The debate might help Clinton with some undecided voters, but McClatchy found Clinton to lose some support among swing state voters in their focus group. NPR has the full transcript with fact checking. I also noticed a reversal in the red/blue partisan color coding at this debate. Donald Trump wore a blue suit while Hillary Clinton wore a red pantsuit. Next debate, Donald Trump should be required to wear the red pantsuit. Jimmy Kimmel summed up the entire election campaign: This was expected to be the most-watched debate ever. The ratings were expected to rank up with the finale of “Cheers,” the finale of “M.A.S.H.” Makes sense, in a way this election feels like the series finale of America. The difference in the debate was preparation, as Stephen Colbert explained: Hillary was so prepared, my new nickname for her is Preparation H.
Seth Meyers took A Closer Look at the debate. Video below. He even fact-checked Clinton: Ahead of tonight’s debate, Hillary Clinton posted an article on Twitter pointing out that no living president has endorsed Donald Trump. Nice try, Hillary, but it just so happens that Vladimir Putin is living.